Lets take a second to look at whirlpooling and how it came about. Professional brewers for the most part use large cylindrical vessels for their brewing. Once the boil has been completed professional brewers generally run their mass of wort through glycol cooled plate chillers into fermentors. Professional brewers desire clean wort to go into the fermentor so that it doesn’t clog the plate chiller. By performing a whirlpool the trub and hop matter will mostly drop and form a small cone at the center of the kettle. Given the small amount of liquid and slow flow rate of a plate chiller brewers have a bottleneck. This bottleneck causes thousands of gallons of wort to sit at near boiling temperatures for 30-60 minutes. During this time late hops will continue to isomerize until 180 degrees is reached. Brewers might have noticed they weren’t getting as much, or perhaps a different, hop flavor than they anticipated from their late hopping. Thus they began adding hops to the whirlpool. Because so little isomerization would happen to hops added to the whirlpool they probably noticed massive increases in flavor compounds. Coupled with massive dry hops this has lead to the renaissance in IPAs we’ve all enjoyed over the last five or so years. Now there is some science behind the flashpoint of various oils contained in hops and the flavors derived from those oils, I’m not attempting to argue that. The premise of this experiment is that on the homebrew level we are potentially wasting our time doing these drawn out hopstands and that the same flavor could be obtained simply from hop bursting given that we can chill our volume very quickly to lock in those flavors. 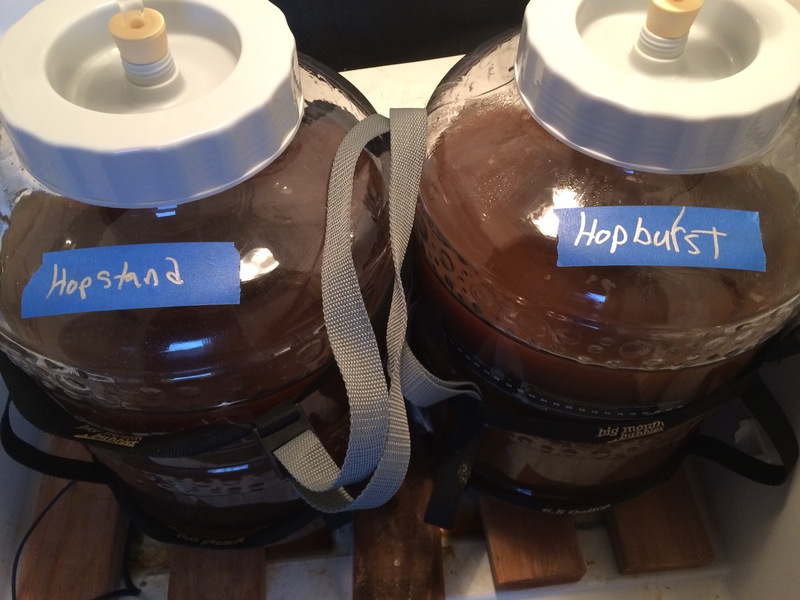 To investigate the differences between using a hopstand versus hopbursting. Brew 10 gallons of red IPA split at the beginning of the boil. One batch will have all of it’s IBU come from hops added at 5 min, the other batch will have an equal amount of hops added with enough added at 30 min to get equal IBU and then chilled after the boil to 150 (sub-isomerization) and held to stand with the remaining portion of it’s hops for 30 min. No discernable difference between the hop stand beer and the hop burst beer. The day before brewing I purchased my supplies and water from my LHBS. The morning of brewing we heated our strike water and mashed in hitting our target temp. A small amount of mineral salts were added to the mash and sparge. The mash was held for 60 min and we collected 12.5 gallons of runnings. The wort was then stirred to ensure consistency and split equally between two boil kettles. Each kettle was heated to a boil. In one kettle a small amount of hops were added at 30 min remaining while the other kettle had none added. After 25 min the hopburst wort had a very large amount of hops added, was boiled an additional five min and chilled to 70 degrees. Back two were for the hopstand, front was for the hopburst. The hopstand wort was boiled for 30 min with the small charge of hops, chilled to 150 and left to steep with the remaining hops for 30 additional minutes. After 30 minutes of steeping at 150 the temperature had further dropped to 148 and the wort was chilled to 70 degrees. Both worts were oxygenated for 60 seconds, and a premade starter of WLP090 was pitched equally. Worts prior to pitching. The carboys were placed in my ferm chamber and set to 66 degrees. 10 hours post pitch. I’ve discounted San Diego super yeast in the past but damn it gets after it! 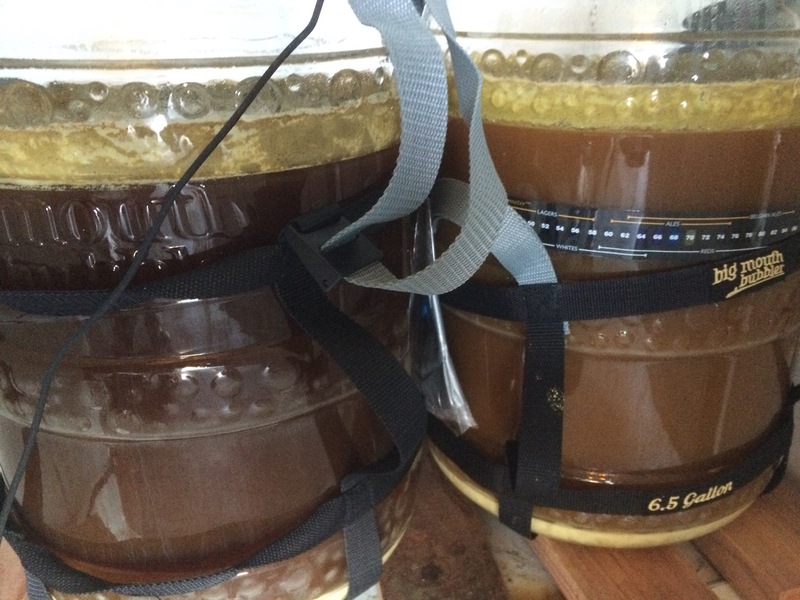 7 days post pitch, really not sure why the color is different, yeast in suspension? Pre fining left stand right burst interesting. Conclusion: I’ve had this beer on tap a few weeks and for some reason the hop burst beer never quite cleared to the level of the hop stand. I don’t really know what to chalk this up to, I’ve let it warm to room temp and it doesn’t clear, so i’m assuming it’s a hop haze. In terms of beer preference I agree with the participants that the hop burst has more hop aroma/flavor. However I disagree with the preference for that beer. I find the stand to possess a more rounded almost juicy hop flavor than the burst. Overall the best beer out of these two is mixing them equally, going forward I’ll certainly be including hop standing in my practice much to my initial aversion to it. As a side note, WLP090 made a fricken awesome red IPA. I love red IPAs, and while this recipe may need a few tweaks, it’s as good as any commercial red IPA I’ve tasted over the years. 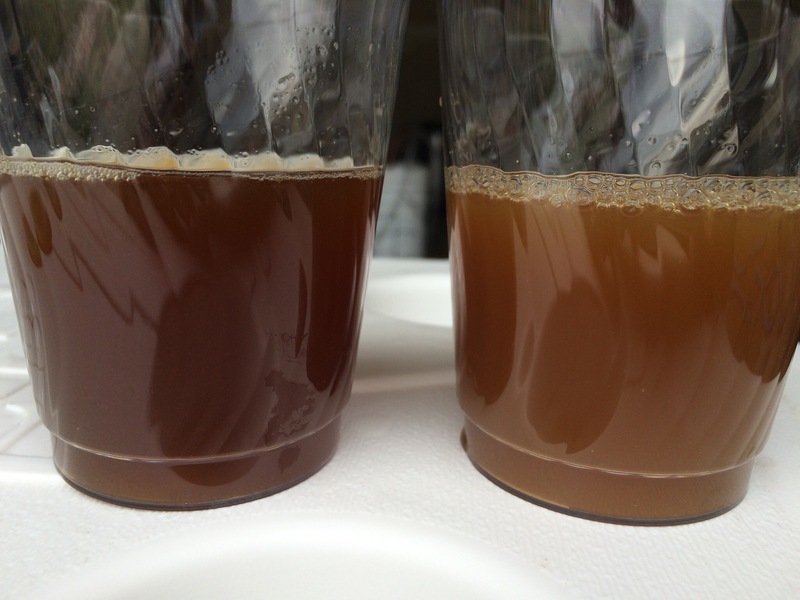 Previous Process Experiment: Can you Ferment a Sour Beer and a Clean Beer Side by Side? 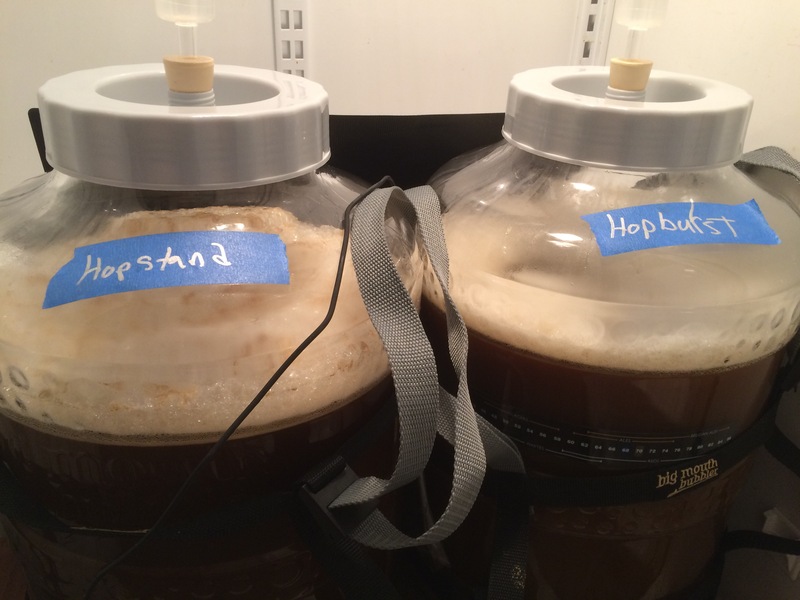 I have done both types hop usage and agree that the beers produced are very different. 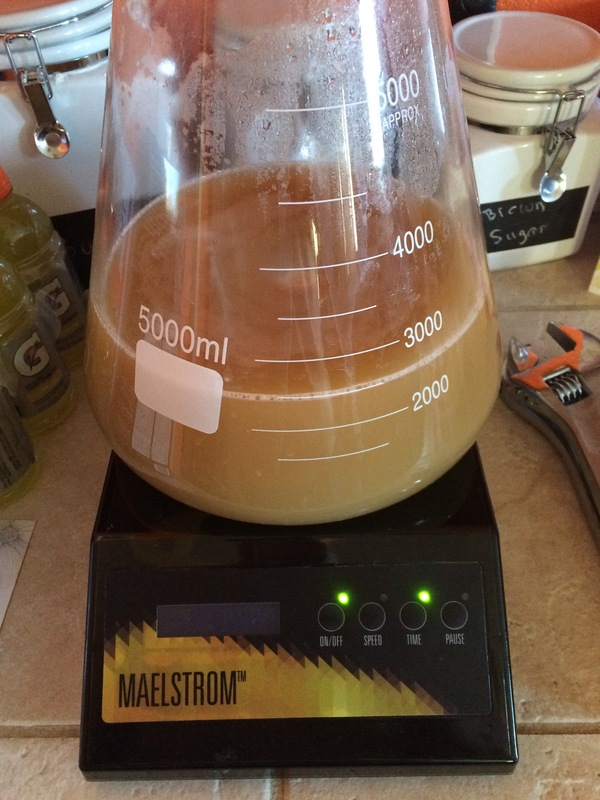 I believe yeast usage lends itself greatly to hop aroma and taste. 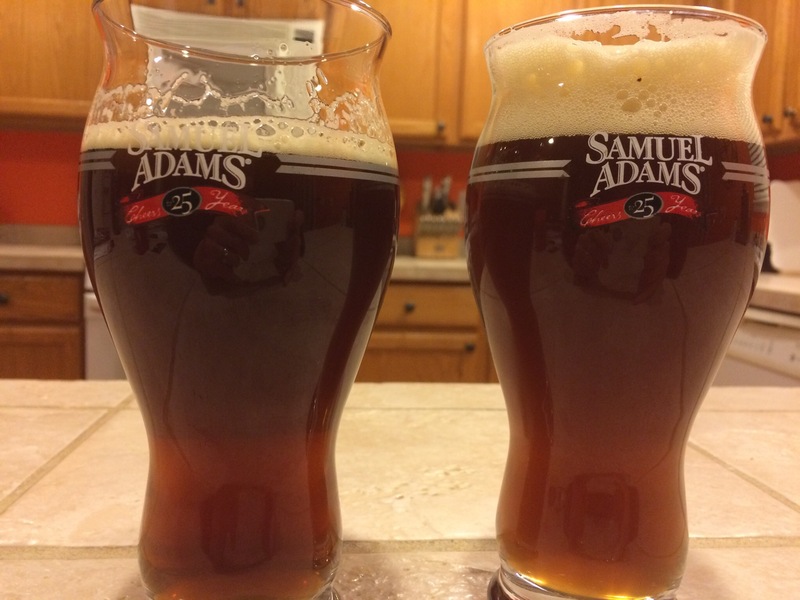 perhaps in the future re do your experiment but use London ale III yeast on one then the san diago on the other. You might find quite a difference. Also, you said pre fining. Are you using a fining agent and if so what is it. Many brewers in New England utilize huge suspended hop bags for late addition hops so not to plug the plate chiller. We can chill/rack to the fermenter 7 barrels in under 30 minutes. I’m sure London Ale would lend a different hop character than 090. Gelatin was used for these beers, I don’t use kettle finings generally. That is interesting about chilling in 30 min, I’m assuming though that the wort is sitting at ~212 while the flow is going through the plate chiller? By this token I’m guessing your late additions are similar to roughly a 5-20 min addition since isomerization is still occurring and producing bitterness. The kettles used are thin walled stainless so its not like using a home brew kettle what will hold heat longer, at least the one I use with a aluminum bottom. Also brewing is in an unheated building where in the winter you had better be wearing winter gear or you will get cold. Late additions are 15-5-FO but can change beer to beer. to continue, we do whirlpool the wort after flameout to mix in hop characters and keep what particles we can concentrated to keep them out of the fermenter as best we can. You pose a interesting thought on continued isomerization while racking. 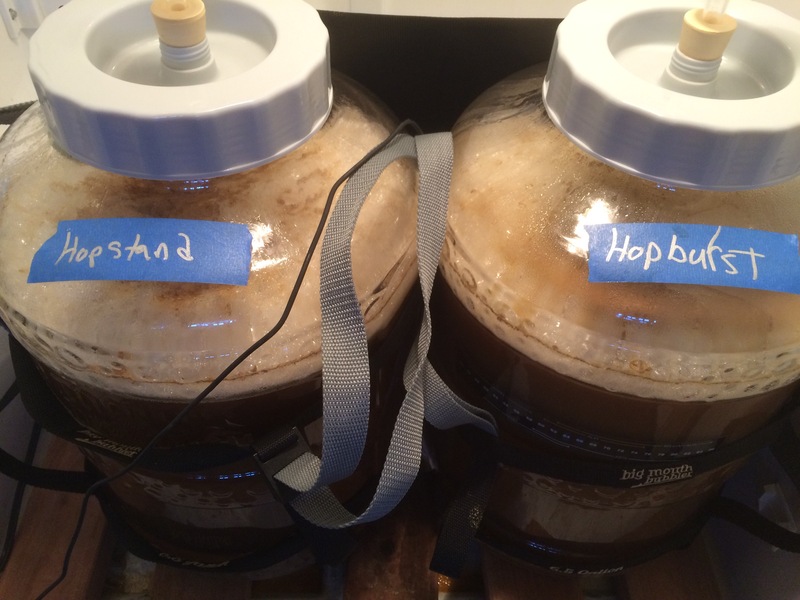 one gets some bittering whenever one adds hops, even in the dry hop. Somewhere somebody did a experiment on this. Read it once, but it is easy enough to take a growler and add some dry hops, wait a few days, then bottle or mini keg it to taste. Next time I,ll keep the temp proble in the boiler and see how much or little heat stays. Staying on this thought, one would have to think a mixed bag of wort is pumped thru the chiller and into the fermenter, unlike home brew scale where one can chill wort below 140 with an immersion chiller in 5 minutes.